Question: what does this bell curve say about the intelligence of the individual BBs? 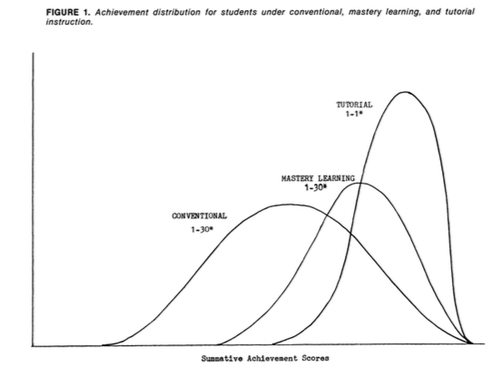 Q: What does a bell curve say about the intelligence or ability of children in a class? A: Hmm. Interesting question. Where is this leading? The Bloom 2-Sigma research suggests that about 90% of students could be at what we consider the 80th percentile level or better, and 50% of students could be at the 98th percentile level or better. What if we could shift the entire bell curve to the right? Wouldn’t that be something? The research depended on individualized instruction – which also appears to be quite an advantage for home-schooled children. At first, this information doesn’t seem very useful – it might be the case that not everybody can afford to homeschool, nor afford private tutors – and it seems impossible to do individualized instruction without multiplying the number of teachers ten-fold. But One Room Schoolhouses used to be the norm. How could such schools function, with children of all ages and ability? It seems absurd to imagine that they’re all reading the same page from the same primer, or doing the same math problems. Hence, instruction must be individualized. The teacher moves from student to student, or small group of students, asks them to work on suitable problems or reading, and checks and assists with their progress. These schools are no more expensive than the existing system – and employ a style which is familiar to many home-schoolers who have more than one child. Some object that few teachers can be expert in everything. But a) the internet fills a lot of gaps, and b) if there are many “one room schoolrooms” in a city, it can’t be hard for teachers to connect with each other, and find those who specialize in “gifted math kids” or “dyslexia,” or any other field. Except in the most rural areas, division of labor can function very well in a network of one-room schools. And c) many classrooms are already flipped “inside-out,” encouraging students to do actual independent work on the internet, and coming to class for help on their projects, at their pace.